How do we determine the identity of flexor tendon injuries by medical examination? Is it possible to spot the ruptured flexor tendon on an x-ray image? 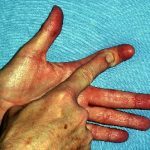 How can one identify a flexor tendon injury in a thumb? The image to the left shows the function of the profundus tendon: the distal interphalangeal joint of the finger gets flexed. 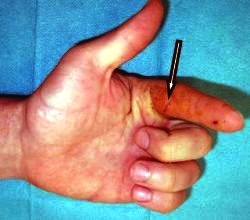 isolated rupture of the profundus tendon. The red arrow in the picture next to it shows an isolated rupture of the profundus tendon. 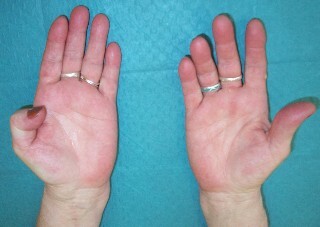 The distal interphalangeal joint in this case can no longer actively be flexed. Please observe in the image to the left how the index finger is no longer able to come up with a flexing motion in the proximal and the distal interphalangeal joint. The minor, almost entirely healed up cut seen here led to the severance of both, the superficialis as well as the profundus tendon. The red arrow in the adjoining picture shows the location of the injury. The superficialis as well as the profundus tendon are ruptured. A flexing motion in the distal interphalangeal as well as the proximal interphalangeal joint is no longer possible. No. Tendons, ligaments, nerves and blood vessels cannot be displayed in an x-ray image. It may still be advisable to take an x-ray image though in order to identify potential associated bone fractures or foreign objects. The right hand seen in the picture has lost the functionality of the thumb. It is easy to identify that, since the distal interphalangeal joint cannot be flexed (as opposed to what can be seen on the left hand). When the flexor tendon in a thumb ruptures, the thumb as a whole remains mobile, since many of the motions of the thumb are guided by muscles of the thenar eminence.